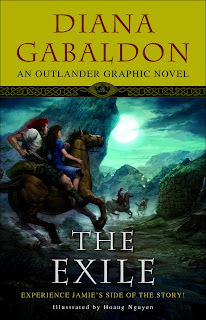 Since Diana Gabaldon puts out an Outlander book once a millennium, I jumped at the chance to review her very first Outlander graphic novel The Exile. The Exile starts just a bit before Claire stumbles through the stones but not in the 20th century, in the 18th with Jamie and Murtagh. Jamie Fraser has just arrived in Scotland from France (where he's been exiled, see?) and is trying to keep a low profile. That's kind of hard what with being attacked by redcoats, and cornered by devious uncles and saving ladies from public humiliation. He's got prison on one hand and parricide by uncle on the other. Then, of course, Claire arrives from the future and it's a total game changer. Diana says The Exile is essentially from the point of view of Murtagh; essentially is an important word because unless he was peeping in keyholes he had no idea what was going on in some places. Sometimes the point of view is Jamie's or Claire's or omnipresent? That's my trouble with graphic novels that aren't memoirs, I never know whose head I'm in. Back to Murtagh- he knows a lot more than I thought he did in the Outlander novels and he is more soft hearted than I ever believed too. 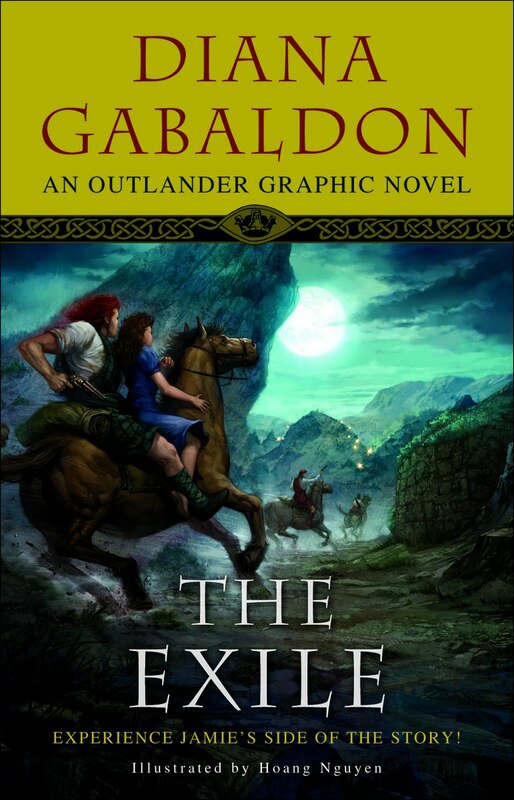 Although The Exile covers about half of the original book Outlander, there are a few additions to the story, like the other traveller and a bit of Murtagh's past. It's hard to cram in a 800 page novel into a 200 or so page graphic novel so there are some parts missing. She does manage to sneak in the wedding night* (oh la la!) and the infamous spanking scene. Of course, anybody who is a fan is going to wonder about how Jamie and Claire look. Diana says in her notes that she knows people will say, "That's not how I imagined Jamie!" and even she says he's not what's in her head either, but close enough. Okay, so maybe he doesn't look how I pictured him but he ain't bad looking. Claire is cute but her gravity defying physique had me thinking things like, "How is that dress staying up?" I seriously believe that there will be women lining up at the plastic surgeon's asking for the 'Claire Fraser.' And Murtagh is less troll-like than I always pictured. Still, the illustrations by Hoang Nguyen are Bew-T-ful and within the spirit of the novel (except for all the dirt. Needs more dirt. So many dirty, smelly people in the books). This is a must have for any Outlander fan. You must have it. But if you haven't read the books, or at least book 1, then put The Exile to the side until you do. I think you'll enjoy it more. *That scene is toned down from the first version which was considered too hot for publication but you can find it on Diana's blog. You might not want to have a peek while the kids are at the computer, unless you are ready to answer, "Mommy what's that man doing to that lady?" You've been warned. I love that it is from the viewpoint of Murtagh. I am definitely interested in this book, if only to see what Claire and Jamie look like. If they don't look like what I would expect, it will likely kill the whole book for me. I have ordered this now, and can't wait to read it! I have to get this one for sure! No matter what they look like, cause I'm sure I'll get over that. Maybe. I got this one for review and I hope to read it soon. Thanks for the review. I definitely need to read this as I've loved all the other Outlander books. I hadn't realised it was going to be from Murtagh's point of view. I can't wait to read it! My copy just arrived at my door. I glanced through the whole thing, and my first impression is Claire's package...her boobas. Goodness, that is not how I imagined Claire. Love your line "there will be women lining up at the plastic surgeon's asking for the 'Claire Fraser.'" That is good, gave me a laugh! Anyway, I cannot wait to dive into the book. Stephanie- Eep! I hope not! Marg- Hope you like it! Swapna- I hope you like it. Helen- I've read them all too. Hopefully this will tide you over. ibeeeg- LOL! I know, Wowsa! She's going to someone's eye out. I. Want. This. Book. I've been listening to book three and am sucked back into Jamie and Claire's drama. I *may* be just as giddy over this series as I am over a certain other series I love, which shall remain nameless. I need to see me some Jamie, no matter how graphic it may be! Michelle- hehe! The Series That Shall Not Be Named! It's an addictive series. Wait until you get to the last published book and have to wait for the next one... ugh! Yes, I have been warned. I'm trying to temper my reading a bit to spread it out over a longer period of time. But I can see that the audios are going to make it verra easy for me to catch up, ya ken? Lucky you! I must get this ASAP! I saw this at the bookstore the other day and I was curious about it, but I didn't open it. A couple other books I loved have been turned into graphic novels and they disappointed me, so I don't know if I will read this one or not... Have to see what wins out in the end, I guess! Thanks for reminding me I need to go buy this!